Many Resident Evil fans likely greeted the news that another movie based on the video games is coming our way this summer. After all, this January’s Resident Evil: The Final Chapter movie was well-received across the board, and thanks to its success in China has become one of the biggest box office hits of the last couple of years. Although the upcoming Resident Evil: Vendetta won’t have the same big theatrical release Paul Anderson’s film did this year though, as it’s a spin-off animated movie that will only be shown in theatres for a limited period of time this June (one day only actually). This also means that the movie’s Blu-ray will be hitting shelves shortly after the movie’s June 19 theatrical release. Actually, the Blu-ray will be available for purchase on July 18 this year. And like the Resident Evil: The Final Chapter Blu-ray, this also comes with a host of extras that fans of the series will no doubt appreciate. The next feature included in the disc is titled “Motion Capture Set Tour with Dante Carver”. Here the host will be American actor Dante Carver, who’s made a name for himself appearing in Japanese commercials and TV series, even if he’s little known in the West though. But hopefully this will be a compelling featurette that will allow us to take a peek into how motion capture is being used these days in animated films, taking into account that the technique is so common in other media such as video games too. The final feature on the first disc is “CGI to Reality: Designing Vendetta” which will likely shed more light on how the latest digital technology was used to create the movie, giving its 3D characters and environments the realistic look we’ve seen in the film’s trailers and clips so far. And as is the case with many movies these days, this Resident Evil: Vendetta Blu-ray release also features a commentary track. Here the movie’s director Takanori Tsujimoto, writer Makoto Fukami and executive producer Takashi Shimizu will be discussing the finer points of the film. They do this in Japanese though, but presumably subtitles will be provided for speakers of other languages. Additionally, a collection of 30 sketches and designs will allow viewers to enjoy some of the concept art that was made for the film, and this sure promises to be a fascinating feature too. To round out the package, there’s also a bonus disc including three additional featurettes. The first of these is titled “BSAA Mission Briefing: Combat Arias”. In this featurette you’ll be able to see the BSAA operatives receive an intelligence briefing explaining the deadly threat they will be up against in the movie. For those not familiar with Resident Evil lore, the BSAA stands for Bioterrorism Security Assessment Alliance, a fictional international organization founded by series character Chris Redfield and others. 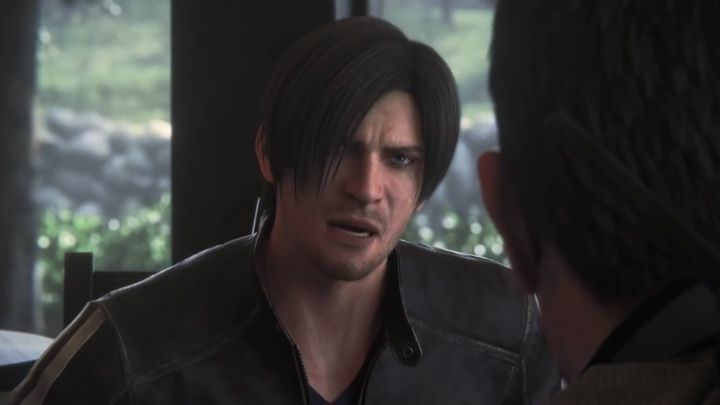 Its goal is to deal with bio-terrorism issues, such as Resident Evil: Vendetta’s “Trigger Virus” a deadly bioweapon developed by the movie’s villain Glenn Arias. The next feature on the bonus disc is titled “Designing The World of Vendetta” in which director Takanori Tsujimoto and the creative team behind Resident Evil: Vendetta talk about the movie’s aesthetic, and also about how they came up with the plot for this latest Resident Evil film. Also, the video footage shown at last year’s Tokyo Game Show (during which the first trailer for the movie was released) is also included in the Blu-ray edition’s bonus disc. Also of interest is the fact that the 4K Blu-ray disc features two of the most advanced audio and visual technologies of the moment. One is Dolby Vision HDR (High Dynamic Range), meaning colours onscreen will be more vibrant and accurate. The other is Dolby Atmos Audio Technology, a new surround sound technology that can make a movie’s audio far more immersive for those with the equipment to experience it. This is the first time that both technologies have featured together in a Sony Pictures Blu-ray, meaning Resident Evil: Vendetta could be one of the best looking and sounding Blu-rays around. So the Resident Evil: Vendetta Blu-ray will surely be one to look forward to for fans of the long-running zombie series, and here’s hoping that this turns out to be a good movie too and one that does justice to the series legacy when it hits theatres this summer. Note: Resident Evil: Vendetta will hit theatres on June 19, 2017 (North America) and May 27, 2017 (Rest of World and Japan). The Blu-ray will be available on July 18, 2017.